What grows together goes together. Are you familiar with this saying? It is a terrific mantra when you find yourself at a farmers’ market. Now you Northern climate people, before you close your eyes and mutter, “Enough with the bragging about California farmers’ markets”, remember that I was one of you. I was the person who counted down the weeks until my neighborhood market started in May, and then counted down the weeks until real actual produce, not just kale and parsnips, arrived. I was the one finally (finally!) buying English peas, snap peas, fava beans, and other green spring things in late June which is not (not!) spring. I have been there. And now I am here in California and I am going to talk about my glorious California farmers’ markets. So there. I used to hit the markets with a list. I would plan my menu for the week and I would try to buy as much as I could at the market. Whatever I couldn’t find there I would buy at the grocery store. This approach led to a lot of frustration. Walking in to a farmers’ market with a set idea of what to buy just might leave you agitated because there is not guarantee that what you want will be there. Even if it is in season. It is better, I have found, to just go and buy what looks good to you. Buy what you like. Ideas will pop into your head and since you are shopping seasonally and locally, all the things you buy will go together in some way or another. What grows together goes together. And if you are really a list person, bring a blank list to the market. Once you have you have been inspired by the produce there and bought what you like, you can make a list of the things you need to fill out the dinners you have planned. Last week, I bought a truly shocking amount of produce. How could I not? Everything looked so amazing. I realized, soon after putting everything away, that Randy was going to be out of town the first part of the week and that I had better get some friends to come eat with me. I made pizzas and a huge salad which we devoured. I told Randy about my creations and he was crestfallen that I had made pizza, on the grill no less, without him. So I made the same dinner, just for us, on Mother’s Day. Yes, I cooked on Mother’s Day. In fact, I made breakfast and dinner. No sad trombone or tiny violins here. I had two friends come down from Seattle last weekend and we spent all Saturday out and about in Oakland and then San Francisco, topped off with a dinner at AQ. It was such a gift to be able to just hang with my friends and not have to worry about the boys, I wanted to thank him for giving me that time. I also wanted to just be home with my family and enjoy pizza and wine on our deck, rather than at a busy restaurant. I could just have easily titled this post Put It On a Pizza. When I end up with a surplus of fresh seasonal produce, I often end up making pizza and combining things I have on hand for a topping. I also do this with pasta or risotto but pizza is my favorite. Especially when I make it on the grill. 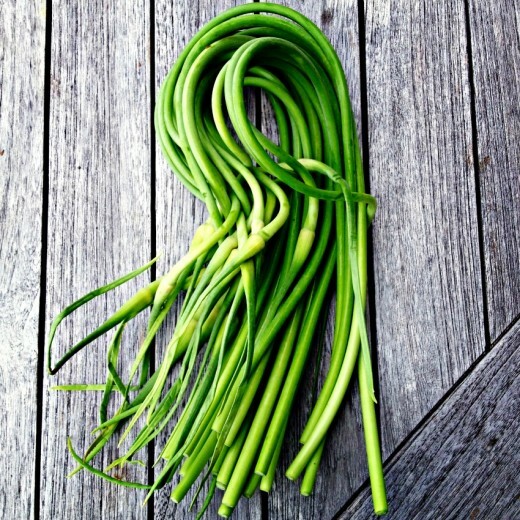 With my crazy produce haul, I had the most beautiful bunch of garlic scapes (see photo above) which I made into a pesto. 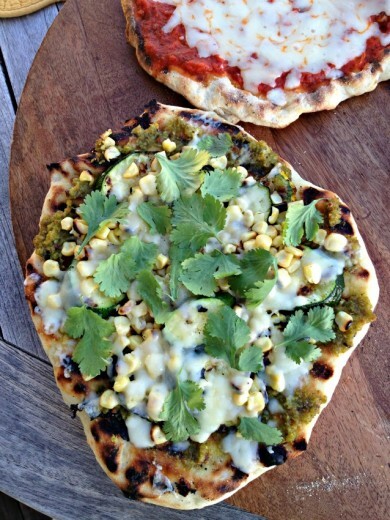 That got brushed on one pizza and was topped with grilled zucchini and grilled corn (corn in May!) and some shaved Manchego cheese. A few cilantro leaves on top too. 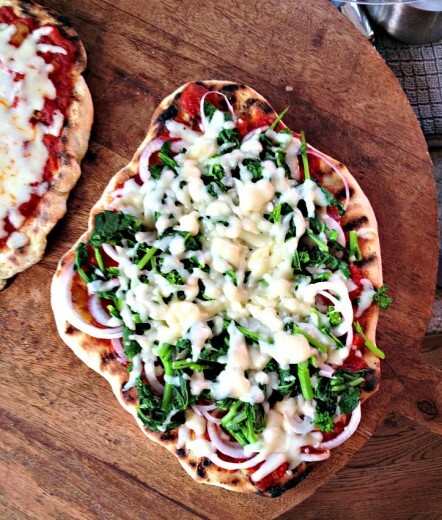 I love broccoli rabe on pizza so for the other one, I blanched a bunch of that, chopped it up, and paired it with sweet spring onion rounds on a marinara slathered crust, topped with mozzarella. When I made dinner for my family on Sunday, I repeated everything but also made a third pizza of just cheese and sauce for the boys. I almost always use Mark Bittman’s pizza dough recipe. It is easy and has a short rising time. I keep promising myself that I will try others, notably the ones that have a longer rise, but the truth is that I am not always forward thinking when I make pizza. If I realize that at 5:30 I still haven’t made the dough, we can still be eating by 7. If you have small people who would be terrified to even contemplate anything other than a cheese pizza, divide the dough into three pieces and make one of them more plain. I’m going to give directions for cooking pizza on the grill, since we are coming upon grilling season, but these can of course be made in a very hot oven. You might not use all the zucchini or corn, but just throw them in a salad another night. The pesto makes quite a bit. It is terrific with pasta, rice, and eggs, or as a sandwich spread. You can always take half of it, put it in a container, and freeze it for another time when garlic scapes are a distant memory. Finally, this pizza has a LOT of flavor, so I didn’t think it needed much cheese. But add as much as you like. You can, of course, substitute another cheese for the Manchego. Heat a grill to high. Place the zucchini slices on one side of a rimmed baking sheet and the corn on the other. Drizzle it all with a little olive oil and then add a healthy pinch of salt to both vegetables. Using your hands, toss well (keep the vegetables separate). Grill the zucchini and corn. You will want nice grill marks on the zucchini and the corn should brown in places. Remove back to the baking sheet. Leave the grill on. When the corn is cool enough to handle, slice the kernels off the cob. Scatter a bit of cornmeal on a pizza peel (or the bottom of a baking sheet can work too). Stretch the dough out to a nice thin circle, then place it on the peel. Slide the dough onto the grill, close the lid, and let cook for4 minutes, or until the bottom is nice and golden brown with some grill marks. Carefully coax it back onto the peel (tongs can be useful for this step). 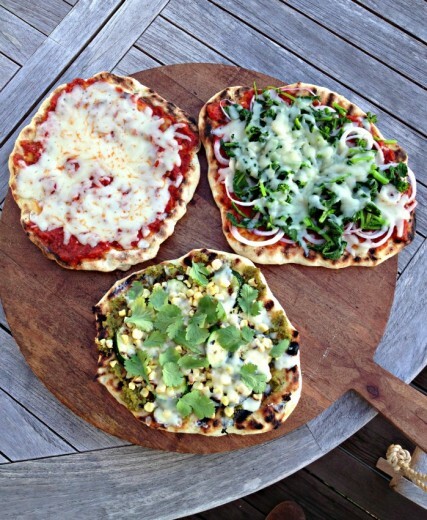 If you are using an oven instead of a grill, just top the raw dough with the toppings – you won’t need to flip. Turn the dough over and smear the top with some of the pesto going almost to the edges of the circle. It is quite strong so you don’t need a lot. Add the zucchini slices and the corn. Top with the shaved Manchego. Slide the pizza back on the grill, cover and cook for 2 minutes or until the cheese is melted and the visible dough is golden brown. Slide back on the peel and scatter cilantro leaves over the top. Let sit for a minute, then slice and serve. To make pizza dough by hand or with a standing mixer, follow the directions, but use a bowl and a heavy wooden spoon or the mixer’s bowl and the paddle attachment instead of the food processor. When the dough becomes too heavy to stir, use your hands or exchange the mixer’s paddle for the dough hook and proceed with the recipe. Combine the flour, yeast, and salt in a food processor. Turn the machine on and add 1 cup water and the oil through the feed tube. When the dough is ready, form it into a ball and divide it into 2 or more pieces if you like; roll each piece into a round ball. Put each ball on a lightly floured surface, sprinkle with flour, and cover with plastic wrap or a towel. Let rest until they puff slightly, about 20 minutes. I only had salted pistachios on hand so I only added a pinch of salt to the pesto. I love that “what grows together goes together mantra”…and it really is true! These pizzas look wonderful! I only wish I had a grill to make pizza on…but I suppose my oven shall have to suffice. 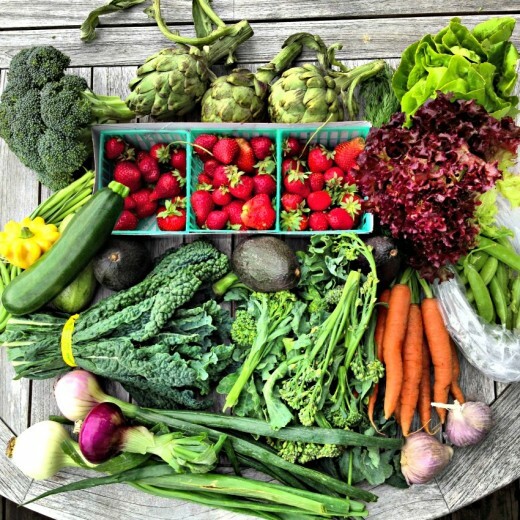 I AM jealous of your farmer’s markets…but I acknowledge that in return, I get actual seasons. So maybe it’s a fair trade? You know that awful song from GREASE – You’re the One That I Want? Well, that’s how I feel about you, you’re the one that I want, cooking for ME! Unfortunately, I, like you, am married to/cooking for my own Harvard educated computer geek. Sigh. Belated congrats on 5 years of blogging. Many a time I’ve mentioned you at the dinner table and my gang o’ men (4 including said husband) make fun of me for talking as if I know you. Sorry dudes, in a way, I do! I love this, Dana! I am that person eagerly awaiting the first day of our local farmer’s market this Thursday! We belong to a CSA, as well, and have been eating our share of kale and potatoes for the past few weeks. I find myself struggling between trying to plan a menu and stay organized (especially with taking care of a baby at the same time) and wanting to just go with what’s in season and what’s available. Reading this blog post gave me some much needed encouragement and inspiration! Yes, same goes for wine, what food grows with the wine from the region, usually tastes great together. (that’s how I remember what food goes with what wine!!). Dana, I made this with leek scapes which I bought accidentally (admittedly they looked a bit fat for garlic…) and it was fantastic. I know you love leeks, so consider this alternative if the scapes are available!